We’ve seen it all – flying rocks, skateboards, vehicles and human fists have all broken storefront glass at one time or another. Restaurant owners and retailers should all have a good commercial glazier handy for these kind of emergencies that can leave a business exposed to the elements. SR Windows & Glass specializes in storefront glass repair services in the greater Phoenix area. Storefront window glass and glass entry doors typically shatter in to many tiny pieces and need immediate replacement. Repairing or replacing is accomplished by cutting a new glass panel to size or fabricating a new dual pane window made of tempered glass. Tempered glass is about four times stronger than typical glass. On the plus side, a new glass storefront can really light up the appearance of your business. Give your store a refreshed appearance by upgrading the storefront glass, which also makes it stronger. The glass of your storefront plays a huge role in the security of your store and inventory. The installation of commercial glass can be difficult so it’s best to contact a professional glazier like SR Windows & Glass. Whether the contractor is installing float glass, laminated security glass, or tinted glass, this is a very delicate job and has to be done without damaging the existing aluminum frame. Our company has decades of experience successfully installing all types of commercial glass. Contact us for your glass installation needs for your storefront. We provide our services to offices, strip malls, industrial buildings, and restaurants. Reach out to us for quality, affordable installation. Keep in mind that commercial installers have greater experience handling large panes of glass, such as what you would see in a storefront. Residential windows are not the same as commercial windows. A residential contractor is likely to have more experience installing smaller panes of glass within homes. Our contractors are licensed and insured to complete storefront glass replacement and glass door replacement. 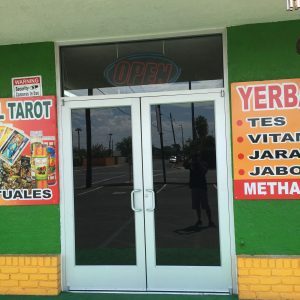 We guarantee our work so you have the peace of mind of having professionals on your side in the event that anything happens to your storefront glass. Feel free to contact us for a quote and we will help you make an informed decision on the type of glass that best suits your application. Get your window repaired quickly and professionally with our courteous, professional installers. We realize that there is not a one-size-fits-all solution, therefore, we will provide you with a highly secure custom window. Why Use Tempered Glass For Storefronts? When regular glass breaks it breaks into random jagged shards. However, the difference is that when tempered glass breaks, it breaks into tiny pieces that are far less likely to harm you. Since an incident with broken glass can occur at any time, 24-hour glass services are available should you need emergency glass service. Don’t deal with issues of theft or damaged inventory if you have broken glass. It’s certainly possible to have it replaced with stronger glass without inconveniencing you or your customers. We offer a number of different types of glass installation including; low-E glass, insulated glass security glass, laminated glass, and tempered glass. Our team of commercial window experts are ready at any time to protect your business by replacing your windows with highly secure glass. No matter what color or thickness of glass you desire we can meet your needs. 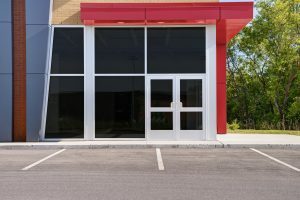 Storefront windows typically consist of both glass and aluminum. The aluminum forms the frame while the glass sits on the inside. Glass can be developed to form the storefront no matter how large the opening is.